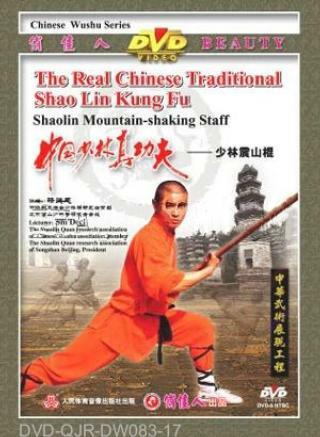 The play of Shaolin Mountain-shaking Cudgel fully displays the power and advantage of Shaolin weapons. Though the cudgel is not a sharp weapon, it stands out as the most famous weapon because it is the most powerful one. When it sweeps down, it seems to make the earth shake. Raising the cudgel with your arms straight is to foil the upper attack while chopping the cudgel is to foil the lower attack. The frequently used movements are sweep in a figure-8 form, chop, point, block and thrust.